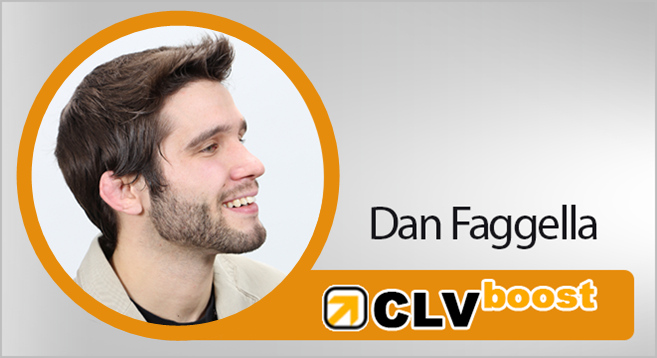 Dan Faggella is the founder and CEO of CLVboost. He is a marketing automation specialist and helps small businesses to improve their customer lifetime value. Dan's emphasis is on email marketing whereby he focuses on maximizing ROI and stick rate. Paul: On today's show I'm going to introduce you to Dan Faggella. Dan is an expert in conversion optimization, but specifically around email marketing, so marketing automation. And his company, called CLV Boost, is all about improving your customer lifetime value. And so his expertise is around getting customers first touch, when they opt-in to your site, how to convert them into their free trial, or from a free trial into an actual paying customer. So, we're going to dive into detail into a really content rich interview where he goes through a lot of examples of the way he's doing that for his customers. And I know that you guys are going to find this really, really amazing. So, get your notepad out, or if you're in the car, then get ready because this is going to be a really, really interesting interview. Hey, Dan, welcome to the show. Dan: Paul, thanks for having me here. Paul: Yeah, I really appreciate you coming on. So, we've been introduced with a fellow colleague, Justin Brooke and I had Justin on recently, in fact, talking a lot about paid traffic, and he really came out with some enlightening gems, especially around Twitter and things like that. So, he put me in touch with yourself, and I really wanted to talk to you because as… from our previous conversations, all my tribe are all focused around software and building SaaS apps. And I know that you've really got into this market as well. But your specialty is around email marketing and nurturing the customer and getting them engaged. So, I wanted to get you on and talk about that. How's that? Dan: For sure, yeah. That's what I like talking about most, especially because all your folks are software folks, we have some really tangible examples we can hop right into, so I'm pumped. Paul: Fantastic. But you weren't always in email marketing, right? Dan: No, no I wasn't. Again it's an odd story. I started off… I've always just had a passion for building my own businesses, and also just doing, working on projects that are exciting to me and correlates with what I really value. And initially for me, in my undergrad years and to pay for grad school, that was just fighting in martial arts. So, I'm a Brazilian Jiu Jitsu guy, I ran a mixed martial arts gym for quite some time. We had fighters do the whole cage thing, and I did all the national competitions and all that stuff and got a bunch of shiny stuff hanging up on the wall. And was really focused on fighting more than anything else. But when I got the bill from the University of Pennsylvania where I went to graduate school, I realized "Wow, I guess I'm going to have to make money doing this. I'm going to have to make a good amount of money, man, this ivy league thing's really expensive." So what I did – I'm in a really small town of 8,000 people, so I started employing email marketing, and I started really focusing on… I was a total newbie back then, even with very sloppy technical skills, I ended up doing a lot better job than the other folks in our little state -- optimizing our site for opt-ins and then really making sure that anybody that became a lead, or anybody that was ever at one point a contact in our system, was continuously being communicated with to make sure the maximum number of leads converted to appointment, the maximum number of no-shows were rebooked, the maximum number of people that dropped out were brought in for additional lessons later on, and that all those systems could be automated because I was in a town of only 8,000 people. So I had to become – in order to pay for grad school and to still travel everywhere and compete and do all the other things I'm interested in – I had to really neurotically understand how to systematize and automate the communication to all the different sub-segments of my martial arts lead base and customer base and past customer base. And I realized, wow, being really neurotic about those skills transfers a lot better to projects that can really scale. So, we built an online e-commerce business relatively shortly after I sold my physical academy, and now I'm consulting with app and software companies that have the potential for hundreds of thousands, millions of users, and these skills sort of scale big. So, yes, it started small, but then I saw the potential to help other folks and eventually start applying it in the fun, real big scalable stuff. Paul: That's brilliant. So, in terms of email, what do you use? Are you specific on any particular marketing automation system? Dan: It's really going to vary per company, per situation, so there's some outbound email marketing campaigns for people that sort of… usually this is bigger, B to B, price point type work where they're either scraping or they're going out and manually collecting large lists of people that would fit a customer profile. Then we're doing outbound messaging, in which case we're not going to upload a list of non opted-in people into a program like MailChimp or Infusionsoft because we're going to get kicked out, so there's other software that we have to use in those cases. But a lot of times I'll be using Infusionsoft, Ontraport, occasionally GetResponse – there's companies up here in Cambridge that are in Marketo and Pardot and other software like that. Or even leveraging an exact target through Salesforce, and it really sort of depends on the situation. A lot of the time, Paul, what I'll end up doing is so long as the system that's in place is functional, integrated and can get the job done, for the highest ROI tweaks that I'm going to make for someone I'm working with, we'll stick with the software they have. But if I really don't think we can deliver tremendous ROI with a very limited tool – like, for example, I've nothing but respect for AWeber, but eventually you graduate from AWeber if you really want a lot of functionality, and there's a lot of other software that are like that. I have nothing but respect for them. But you can't do a lot of functions with them, so if I think that we need to graduate, then we'll take them up. But, ultimately, Paul, I have no particular proclivity for one software that everybody should use. It really is a case by case basis. There's a lot involved there. Paul: But just to finish on that, though, let's say there's a lot of people who haven't got into anything. Because I get a lot of people saying, "Ontraport or Infusionsoft?" Or even Marketo, but I know Marketo's then another level up, isn't it? Dan: Yeah. It's pretty pricey. Paul: Yeah. So, what's your view on those? Dan: Yeah, in general – it's a little bit interesting because I have pretty solid relationships with a lot of those software folks, especially Ontraport and Infusion. I know very nice people at both companies. I like and respect both of them. I happen to believe that Infusion is a little bit higher in terms of its overall functionality. There's just a little bit more that you can do. And so I would generally lean folks in that direction. Sometimes when people are really scrappy, and they're just starting off, I'll recommend something like GetResponse with some very basic functionality. But as soon as we can graduate, as soon as we can sort of quote unquote "get serious" when it comes to generating revenue with email, really building a rich database -- which I'm sure we're going to talk about – of leads with more data than just name and email. You know, we want to understand their past actions. We want to understand the date they came into the system, different data points about them that we can collect manually or situationally. Infusion is usually a first kind of jump into quote unquote "big boy pants" that I'll be recommending a company kind of make the hop into. So I have a little bit of bias working with them for so long, but I believe that functionality-wise, they're tough to beat. And at a certain level of scale before you really need Marketo, I tend to lean in that direction. So, not dogmatic about it, but I very much recommend them. Paul: Got it. It's good that I use that then as well, right? Paul: So let's just talk a bit – let's just go down to a bit of nuts and bolts. Paul: Because to a certain extent a lot of people understand the sort of free trial to purchase model – I'm forever persuading people to avoid freemium because I think every test I've seen now pretty much says, "Don't go freemium" – not unless you have huge amounts of marketing dollars. So, the key then is obviously at first touch, when someone hits your site, you want to get them obviously on board either into a free trial funnel or obviously into an actual customer, how do you go about that? What's your viewpoint on that? Dan: Yep. For sure. So, when it comes to bringing somebody in from any kind of information collection, any kind of opt-in, so to speak that isn't a purchase, we're going to be working on similar activities that are going to be geared towards getting them to eventually make that first purchase, but with a free trial model, it's relatively simple. And I could actually explain a customer retention sequence that would actually work somewhat similar, Paul, because I know you'd advise some folks to sort of lean away from freemium when possible. Some people are going to go that route, others aren't. We'll talk about freemium first, then we'll talk about stick rate when people just go straight for purchase. So, if we're going with a freemium model – for example, one of the companies we're working with now, although I won't name names – is in the day trading space. So, they run software that helps people make better decisions about their kind of small trading – the small trades that they make on a day to day basis. These are people that either part time or full time, they have a bunch of computer screens and they're trading and swapping stocks on a regular basis. And when they become a free trial person, which I believe is something like 30 days, or whatever the free trial period is, they sort of , they opt-in, and then you know they don't really get communicated with at all. Then they'll just be billed on that first month, and then that'll be that. The goal of a solid free trial sequence would be convincing these folks of the particular value of being able to stick around with what you're doing and to be able to track that and ensure that it's working. So, for example we could take the present no email marketing, basically no communication model, we can look at the conversion rate of a trialer to buyer, and then we can look at the average stick rate overall over the course of a long time – this company's been around for a little while. And then we can implement a stick sequence. So, how this might work, Paul is – I'm going to go very, very basic, then I'm going to talk about how to step it up a notch to a level that I feel as though it's advantageous for almost any software company. So, we'll start with the real basics. The real basics are, if you have a free trial period – 14 days, 30 days, seven days, whatever it is – you need to be able to, without annoying anybody, convey the value, the richness, the worth of what you're doing, and the benefit you can deliver for somebody. So if, let's say, in this case we're talking about day trading software – for these guys, if it's allowing them to – you know, one of the benefits for this company is giving people a broader view of the various happenings in the market that they can see all at once, and they can find interesting opportunities that they might want to hop in and trade with – sort of an interesting dashboard. But it's not something you can explain in two sentences. It's something you sort of have to see. So, instead of counting on them on exploring that part of the app – and it's only about one-seventh of the total functionality of this big, old software here – instead of counting on them diving in there, to be able to drip communicate the value of particular features. So, we're generally speaking, Paul, in any given email sequence, we are going to include three basic ingredients. If we think about this like eating a balanced diet. We're going to have education. We're going to have testimonials. And we're going to have calls to action. Testimonials/social proof. So, social proof – and you know this from marketing, Paul – on your sales page you'll have plenty folks that say, "Aw, man, Paul's content marketing software is so great," from this guy," "Aw, man, Paul's content marketing software is so great," from this girl. And, of course, you have really specific testimonials with specific benefits. You want to be able to deliver that to someone's in box while they're on the free trial period at the right frequency to the point where they can see how other people are benefitting from what you've got. In addition, you want to find those most important features – those real benefits, those features that allow for the real benefits that makes your software work three times what anybody's paying for it. And you want to shed amazing light on those with a short video, a short instructional blog post with step-by-step screen shots and a link to send them back into the thing and go try this functionality. You want to get them engaged. You want to get them clicking. You want to get them hooked. Because when they've been in there, when they've gotten their hands dirty, when they've gotten to see the benefits, when they've seen how many other people have had these testimonials, now they're realizing, "Oh, this is why this could be so darn useful for me. This is why this would be really beneficial for me." So we can convey that value. So if it's 14 days, seven days or a month, you want to find a good frequency, whether it's every three days, four days, two days – especially early on I like to be a little bit more frequent – let's drip the major features that allow for the biggest benefits of your software. What makes it amazingly worthwhile. And then we want to have calls to action to drive them right into to that – and to use it, use it, use it. Get their hands dirty, see how beneficial it is and see what other people have had to say about it. Conveying that succinctly, over the course of whatever your trial period is, will often yield a significantly higher number of buyers and potentially a better stick rate when they become buyers. Does that make sense? Dan: Yeah, yeah, yeah. And not necessarily hard. I don't want you to get me wrong, like, "Man, you're going to love this when you buy it in seven days when we whack your credit card." Well, I don't know if we're really going to say that, right? Paul: Well, I didn't mean to use that terminology, I guess. Paul: We're all gentle – we're all gentle online anyway, right? Dan: Yeah, yeah. We'll be a little bit tender with them. But at the same time, hit them hard, quote-unquote, at least in the respect of – because here's the thing, Paul, whoever's listening to your podcast right now, they're not running Facebook. So, Facebook, they don't need to explain the benefit of Facebook. Because I have a Facebook account, I'm going to log in every day, almost every day anyway, regardless. It just is what it is. And same thing with Twitter. But your new software, that they just got a free trial of, you cannot possibly expect them to wake up at 8:30 in the morning, check Facebook and log into your software, then the next day check Facebook and log into your software. You can't. You're not on their radar. They don't understand your benefit. Facebook is obvious. They can connect with friends. They look up pictures of their ex-girlfriend. You know, they can post interesting quotes from people that they wish they were like, whatever the case may be. But your software, they don't quite get it, and they're not super-committed to delving into it all the time. So we need to be in front of them in places where they are all the time, which is email. And email is an amazingly direct route to make sure we get them back in to see this benefit. Get them back in to see how these other people have benefitted. Get them back in to see this amazingly simple tutorial about how they can glean this amazing benefit by using this one small function of this amazingly robust software that we've created for them, blah-blah-blah-blah-blah. We make it easy, we make it simple, we make it fun, we make it cost effective. We highlight all those factors without having to be salesy. We're just conveying value early on. And we're hitting them where they are, which is not opting in to your – which is not logging in to your thing. Unless you're Facebook, nobody's logging into your thing at 8:30 in the morning. But they are checking their email. And that gives us a great chance to reel them in, reel them in. reel them in, reel them in. Get that attachment, get that value connected, and then we have a higher stick, and a higher conversion because people are going to be hanging out, paying and really knowing what they're paying for. Paul: Right. Right, got it. And of course you know just outside of email, you'll probably be doing the same thing with retargeting as well? Dan: Yeah, you completely could. There's a million different games you could play here, right? So, if when they convert from free trialer to… when they convert from the free trial...you know sign up for the free trial page to the thank you page, we could slap a pixel on them and then we can have retargeting banners that maybe drive them to educational material. Then, towards their last seven days, their last week or whatever of the free trial, we might have explicit follow around banners that are driving them to "Hey, sign up now and get a year – when you sign up for a year, you get this bonus" – or whatever the case may be. We can have explicit CTAs – remember I mentioned calls to action. So, we can have some potential calls to action there as well. Normally with free trial, though, we're going to be billing them in the seven days, so we don't really want to drive them to a sales page. Normally that pixel, that retargeting you're talking about, Paul, happens when they go to the free trial page, but they don't sign up. That's often when we're going to pixel them and make sure we can get them to sign up. Make sense? Dan: Usually that's how that works. We don't have to tell them to get the credit card out because if you're Compete.com, or CrazyEgg or whatever, the credit card is on file. You're going to get billed at a certain point. It's probably not good for us to say, "Hey, remember that credit card's coming out in 14." Dan: You don't want to be… I don't know. You don't want to be… you don't want to sound gruff about it, right? They know what they signed up for. Paul: You just want to make them feel good about where they are. Paul: And make sure they get the wow out of it, right? Dan: Yep, yep. So, they want to have that wow, they want to feel that wow. They want to know the value of what they're getting when they hop in. And this gets us to another point here. If we're not working with a free trial model, and we're working with a just straight into purchase model – and this would work for free trial as well – one thing I like to get, Paul, I really, really like to get -- like I don't just sort of like to get it I actually really, really like to get it -- is a critical bite of information about the major benefit that they're aiming to glean from this thing, what they're aiming to derive from this software, from this purchase – from whatever it is that they've gotten. So, if we're talking about software… you know, in the day trading example, it might be their financial goals, it might be do they want to quit their job and do this full time? Are they already doing it full time and they want to take it to the next level? We can ask them where they're at in their sort of day trading trajectory. Are they just new and they're dabbling? Are they really looking to be able to do this full time? Are they doing this full time, and they want to be able to be making seven figures a year -- whatever the case may be. And if we even give them three buckets to put themselves in when they cash out and they push that buy button or whatever the case may be. Let's say we're not doing a trial – they're just buying. Then, when they've bought, ideally, Paul, you're doing software as a service, so you want them to stick around for as many months as possible, right? Dan: In order to do that, you presumably need them to understand the value. So you, Paul – and I do as well – you have some level of coaching and interaction with you where software folks are working with you, obviously if they're paying every month they know what they're paying for, they understand why it's helpful. You've gotten to talk to them in person, so they've really got a feel for that. With software you don't get to do that. So, for all you know – and many software this is more than the case – the percent of people that are using what you got is maybe smaller than you think. And at the same time, we're – they might not even be aware of some of the big gems of the functionality of software that you think is so cool that you've created. So, when they purchase, if we can know – so, let's just say for example, just pretend, Paul, you're paying $200 a month for day trading software. And let's say you're a brand new day trade guy, and you're just getting into this. When you buy, when you slap that credit card down for $200 bucks a month, you get, let's say, twice a week, once a week -- something along those lines – very specific, tangible tutorial videos, education, maybe even some other fun case studies of other successful clients about how other newbies have taken it to the next level and really gotten to make a nice six figures a year from day trading by leveraging specific little simple functions of your software. Make sense? Dan: Now, if you're a newbie, and you've told me you are when you've slammed your credit card, then I can talk to you like that, and I can make you stick. I know what's going to keep you around, and I can talk exactly to you. I'm not going to talk, I'm not going to say, "Hey, I know you're spending all day long in front of seven screens, and I want to make your life easier." Because you, Paul, you would say, "No, I'm actually a beginner. What the hell are you talking about?" So, if I know your circumstance, if I know what you're aiming to glean from what I have – and in this case experience level is what we're appealing to. Other software would have other criterion. And, of course, that's part of the strategic decision-making process about this stuff, and we can test all of it. But, you want to be talked to as you. You want to be talked to, to what's going to be beneficial for you. So if you get specific use cases and very basic functions that work with a very basic understanding of day trading, then I'm feeding you in a way that's contusive to you hanging with me. If you are a guy who's already paying for a bunch of different software, you're doing this full time, maybe you're doing a third of a million bucks a year, and you really want to step it up. You want to have a better handle on the market. You want to be making better trades, more trades on a daily basis. And, again, you're a full time guy really looking to really step it up, then I'm going to talk to you about more advanced concepts. I'm going to talk to you about how to use this software with your Scott Trade account, with your… whatever other accounts you might have. I'm going to talk about trading principles that you would understand as a more advanced guy, and how my software can help you simplify your dashboards and make decisions faster and more profitably. So, I'm going to speak differently to you. I'm going to talk about making that jump to… I'm going to speak to you as a full time guy looking to take it to the next level because you've told me you are. And that is the kind of education and communication – so long as I'm not emailing you every day or something primarily, which is probably going to annoy you – if I'm dripping that out over your first X number of months of being with me, then I up the chance of you sinking your claws into all those functionalities that I want you to get addicted to. Understood? Dan: Yeah, so if I know… not just, "Hey, what do you know about that customer?" "Oh, he's a buyer of my software, so I know he likes day trading." Well, that actually really isn't all that freaking specific. You understand? If I know what phase you're at of day trading, where you're trying to get to, now I can speak to your goals, dreams, et cetera. So, Andrew Warner – you know Mixergy Paul? Dan: So Mixergy is one of those cool interview shows. So I did the Mixergy thing, and Andrew Warner actually – at least at the time of this recording, I didn't work with him formally, but got to kind of catch up with him a little bit, super nice guy – with respect to Mixergy, and he has an interstitial ad on the front of Mixergy that is asking people the major benefit they're getting out of business training. Because it used to be just opt-in for Mixergy, and we'll sell you on business training. "Oh, what do you know about that lead?" "Oh, he's interested in learning about business." You understand how that's really not specific at all? Dan: So, instead it's, "Hey, I'm at a job, and I hate it, and I want to start a business." "I'm in a business right now, and I want to scale it." "I'm looking for a business idea." How differently do we need to talk to those people to get them to get their credit card out, Paul? Very differently. So, Andrew's starting to implement this kind of thing, and it's very much not new to the marketing world, but it's very new to software folks who are not actively thinking about segmentation and optimization. And if it's implemented once, and it sits there and runs automatically, and we can take an extra 15, 10 – even if it's eight percent of the people that sign up for the trial and turn them into buyers, what does that look like after 12 months of that conversion rate added on to whatever we're making already? It ends up being a very big dent in the pocketbook. Paul: So, what you're talking about then really is just, really, to really sub-niche down – if sub-niche is the right word but – really to narrow down, on your buyers into what is their real triggers, yeah, for taking that free trial, and then really work on that specific trigger. Almost do a customer sequence just for that specific interest. Dan: Yep. And in software, that's really far out, right? Like, "Oh, my God. Segmentation?" But, at the end of the day, there's companies like LL Bean that, for 100 years, have been breaking people up into different demographic and buying habit groups and mailing out different postcards and catalogues and whatever else based on all those differences. That is not a new thing. Dan: How do you find those buckets to put them in, Paul? Paul: Well, how do you get them to tell you what it is? Dan: Yeah, yeah. Well, one of the things I'm really not afraid to do is, number one, you can always survey people after they've purchased. And if you have no idea what those buckets are, the best way to start is to start with very qualitative answers. You know, "Why did you get this? What were you most interested in?" Very open-ended, right? Let them type in their own answers. And then when you can find a certain number of trends, you can say, "Hey, you know what? I realize after reading through 300 of these that there's really only – you know, I can boil this down to four buckets." You know, people are looking for blank, blank, blank or blank – that's really it. And I can broadly put them in there. I don't have to create 20 different sub-segments. So, Paul, if it's cool for you just as an example, your content marketing software, what's like the major reason that people are paying you every month? Why are they justifying that from their bank account to be paying you every month for that software? What's the sort of the biggest benefit, I guess? Paul: So, well it's interesting you say that because I was almost going to use that as an example, but to turn it around – let me turn it around this way to you. So, my content marketing software has three types of avatars. So, you've got, like, the blogger or the person who's creating content to publish on their site, and to curate content from their newsfeeds, and Twitter and all that sort of stuff. Now, they're obviously focused on traffic. So, that's their prime motivator. However, the marketing agency, who's doing the same sort of thing, but it's doing it for their clients, they're more focused on, "How can I organize all this content, you know, in a really slick way? So, then I've got the next three months all planned out for this particular client, and that's going to save me loads of time and money. Paul: And then, of course, you've got the enterprise, who's more than just focused on the big picture. You know, what's their content marketing strategy for the next six months? "How many leads is that going to generate me?" And all that sort of stuff. So, it's almost like three groups, three avatars there. Dan: So, how do you know what those are – sorry, if you don't mind me asking. Paul: Well, at the moment the plan is I'm going to target – my current customer base is just bloggers. Paul: My current customer base is bloggers, that's right. The new release of the software is more marketing agencies. And so my landing page is going to be very simplistic in that it's going to have for bloggers almost "click here," for marketing agencies "click here." And then they’re going to go down to two different landing pages obviously orientated towards them. Dan: Yeah, I mean, you can get as granular as you want, right? I mean, for my martial arts gym, if you'll believe it, I had a landing page for Brazilian Jiu Jitsu Self Defense, Brazilian Jiu Jitsu Fitness, Brazilian Jiu Jitsu Competition, Mixed Martial Arts Self Defense, Mixed Martial Arts Competition… I mean, it goes on. You can get as nichey and funky as you want to get. But, yeah, for you, finding those three main folks that you want to be able to target, and then making sure you're communicating with them like that. And for you it would be, because they're not doing a free trial first, for you it would be, yes, by the landing page. So, if you have content that's aiming to draw in marketing agencies, you want that to be linked to guess what landing page – the fricking marketing agency one, right? Not the other one. Dan: So, you want to have them land on the page that fits that avatar. And there's all sorts of software companies that do it – well, actually, it's remarkably uncommon in software companies. There's other kinds of businesses that do this very well. HubSpot is one software company that actually does it pretty well. But, yeah, you would have those three different segs. And then hypothetically, Paul, if you wanted to increase stick rate, you wouldn't send the enterprises a bunch of stuff about how Joe Shmo blogger made his first $25 on the internet. Dan: They would be just like, "Oh, thanks. Like, I can see that this software isn't for me." But if you talk about other software companies, I mean other enterprises, other enterprise use cases, other enterprise benefits, then this guy's like, "Man, there's a lot in here for enterprise. This is great. This is a real fit for us. I can see how these other companies have benefitted us. This is a real fit for us." So, yeah, so you can tailor your communication to increase your stick. And for anybody out there who doesn't know who their avatars are, or doesn't know how to bucket their people, two really good ways to do it. Number one, give them the very open ended survey after they buy. Very basic questions would include – you can always ask the lead source kind of questions. Analytics will often tell you a little bit about that. So, "Why did you purchase our software? What were the other alternatives you were looking at? What is the major goal you have for our software? Please describe your business to us?" Four simple questions and maybe a drop down, that will often yield a lot of data. But one thing I really like to do, Paul, is I like to pick up the phone when people buy and just pick their brain. Just say, "Hey, blah-blah. This is Billy from, or this is Dan Faggella with whatever company." And I'm going to be doing this with the software company we're working with in the day trading space. I'm just going to call past customers, call current customers, find out all sorts of cool things about the functionality that actually got them to buy. The other software alternatives that they were most seriously taking and that almost detracted from this sale. I'm going to find out that information from phone calls. So you can always go old school. But once you've got those buckets, Paul, as you can imagine, if you can lift your conversion rate to buyer, conversion rate to trial, even by nominally small levels – and if you do this right, you should lift it by much more than nominally small levels – you make a big dent in the bottom of, in the bottom line, of what a whole year looks like when you've got conversion rates that are doing that much better. Paul: That's really cool. So, and I think the other thing, picking up the phone and phoning your customer right after the purchase is magic because their enthusiasm has never been higher. And all of a sudden, now, you're just breaking down that barrier from the online world. You know, you're making it a personal connection, which kind of locks them in as well mentally. Do you know what I mean? They know there's someone they can call. They've almost like putting a face in a character. Paul: And attaching it to the software. So they don't really want to just quit like that because they kind of know you and they don't want to let you down. Dan: Yeah, there is a little bit of that. There is a little bit of that too. And you have more expensive software, so obviously it matters all the more. And you could even test that and see if it improves stick, you know? Every third customer gets a phone call, and six months later we take a look at dropout rates, you know what I mean? Dan: If you're doing enough volume you might actually be able to test that. But push comes to shove, Paul, the first thing you can do is, yes, you can make a warm connection. But you can also get a bunch of data you could never get from a Google doc form. Paul: Absolutely. Yeah, yeah, definitely. Dan: All kinds of rich data that lets you build fantastic avatars and appeal to benefits that are going to make people stick around and pay you every month forever. Paul: Right. Absolutely. Brilliant. So, that's really interesting. So, we've kind of covered the sequence and the type of messaging and segmentation for people in that sign up to conversions process. And I know that you have some experience also around the engagement aspects once they're onboard you want to keep them involved in the app until they get to that hook. Paul: Not that hook in terms of the sales perspective. Until they get hooked, I suppose is the right phrase. Paul: What are your thoughts on that? Dan: Yeah, completely, Paul. So, again, the email sequencing you're going to compose – although the calls to action will be different, the email sequences will still involve the three main ingredients we talked about, which is education, social proof and calls to action. The calls to action here might be telling them to watch an educational video, might be telling them to use a particular function or read a particular use case, and it all ties into anything that's going to be contusive to stick. If you have an upsell, you can always be moving them towards an upsell. But keeping them at stick is beneficial. So, if for example, for you, Paul, again your software is not going to have a free trial, then, yes, you want a custom landing page. But if you were to have a welcome sequence, and you wanted to get people using your software enough to the point where they can't live without it. That's why software is sticky, right, Paul? Because if you quit Infusionsoft right now, you'd be in some pretty deep trouble. Dan: If you're Infusionsoft exploded, you'd be in trouble. But if your subscription to Sports Illustrated exploded, you wouldn't be in as much trouble. Dan: Because people become dependent, and you get that pain of disconnect. And unless you get a certain level of connectedness, you will not have any pain of disconnect, and you'll likely have a lower overall retention. So, if people are just going for the purchase – let's say, Paul, you're starting to sell more to marketing agencies, if for the first two months, you know, twice a week, once a week they're getting case studies, and they're getting educational snippets of how marketing agencies can save tremendous time and handle much bigger deal flow in a much more organized way with your amazing software. And you're giving them the exact ways to do it. And you're telling them specific steps. "Hey, the last project that you closed, load it up as a new project now, and check out the new feature that we have where you can schedule content and bah-bah-bah. And share the schedule across your agency." You know, whatever, right? Dan: And then maybe the next email, four days later, seven days later, is a use case of XYZ Marketing Agency in Cambridge who is juggling 15 different spreadsheets, and then they got your software. They watched your videos. They organized everything they have. And they've been able to hire four new people and just open up a ton of additional deal flow and really take advantage of the opportunities around them because they had a system that could scale with them. I mean if they're getting dripped, and they even open 10 percent of that communication over the course of two months, they are getting hooked into the belief, into the benefits of what you're doing for them. So, for just going for purchase, then our focus is stick, and our focus is engagement. Make sense? Dan: So that post customer sequence, it's not like "Cool, we got the money. Run away!" It's sort of like, "Well, we might want to really ensure that they use it, and like you said, get hooked and have that pain of disconnect ." You know, not just from a negative standpoint. Not, "Oh, let's give them a pain of disconnect. Let's have them use this and get some great benefits. That's why we built the darn thing." And we can't count on them discovering every facet of that by themselves. That's really our responsibility to convey. We have to be marketers. So, in order to increase that stick rate, we can have, after people purchase, sequences that go off that are segmented to encourage stick for the category of that person. And then what we can do, is we can track how that influences stick. So, we can run that on half of the buyers and then not on the other half. Or we can look at our stick rates over time, and we can implement it now. And then we can check our stick rates again in X number of months, and we can see how we've improved our numbers and how we can work with. But as you can imagine, unless you really screw something up, if you have specific, targeted, purposive, educational beneficial content geared towards the person that just bought your thing that helps them use it in tremendous ways for themselves to get the most of it, you're really hard pressed to screw that up and not bump your stick, not reduce the number of immediate drop outs, not move the needle on important business metrics. So, if you are just going for purchase, then that stick sequence implies all the same kind of principals we just talked about. I hope that was clear. Paul: Yeah. That makes sense. Absolutely. Brilliant. Well, look, we're coming towards the end of the interview actually. Paul: And clearly this is something that you're fascinated with, and that you love doing with software companies. And your main business now is CLV Boost, is that right? Dan: Yes. CLV Boost is the consultancy that we have out here in the Boston area. Paul: Brilliant. And so people can come to you if they're looking to identify and set up these sequences, then they can get a hold of you here, yeah? Dan: Yeah, completely. And we have a couple very tangible examples of what I call "plug and play" strategies right on the main website. So CLVBoost.com down at the bottom there's a contact form that also has sort of a white paper in there as well, which is some of the real basic like, "Take this, run with it and you will do better than not using email marketing." This is likely to be a better go-to strategy that we've seen effective across the board. And that's right at the bottom of the page on CLV. So people can get in contact with me there, grab the white paper and learn a little bit more. But, yeah, we're definitely doing a lot in the software space. And there's so much potential here, Paul, so it's exciting for me. Paul: Yeah, absolutely. And there's brilliant software out there. And especially in the age where you can actually get stuff built really, really quickly and push it out there. The technology – and we were talking about this earlier – the technology that's going out is absolutely amazing. But, of course, you still need to go back to grass roots and market the thing. Dan: Yeah, you do. And a lot of the time, the software folks that I work with anyway, it's a little bit different than people in the nutrition space or in some of the other online spaces. Marketing is often really an afterthought – it's sort of all about the product. And I think the product, by all means, we should be attached to the product, but if we can put a strategy in place to make sure we can actually make some bucks with this thing, you know, marketing fundamentals is the place to start. And if we're working online, you're selling online, there's few higher ROI channels than email. Paul: Totally. Brilliant, Dan listen, I really appreciate you coming on the show. I found your insights absolutely fascinating. I've certainly made a ton of notes here. So, we'll be in touch over the long term. Paul: So, thanks ever so much for that. Anyone listening, for all you guys, go to CLV Boost, drop Dan an email if you want to talk about sequences and getting these customers on board and converted. So, thanks for your time, and I'll speak to you soon. Wow, this was extremely helpful. Thanks for the great interview! Thanks Joe, glad you gleaned value from the interview.